Dr. Sol Taylor: VDB's New Lincoln Cent. The U.S. Mint bowed to public pressure to remove artist Victor David Brenner's initials from the reverse of the new Lincoln cent in 1909, but not before releasing 27 million of them in just three days (left). Brenner's initials returned in 1918, less conspicuously at the base of Lincoln's bust, where the remain today (right). he new Lincoln cent was released Aug. 2, 1909, through several hundred East Coast banks. A frantic rush of customers swallowed up the 1 million coins shipped to New York City the first day. By the following day, several banks posted notices limiting purchases to 100 coins per customer. Street vendors were offering the new coins at two for a nickel. The coin was designed by a contract artist and sculptor, Victor David Brenner. He was appointed by President Theodore Roosevelt in 1908 to design a new coin with Abraham Lincoln as the main feature. Brenner designed two different coins  one a cent, and the other a nickel. When his early cent designs were sent to Treasury Secretary McVeigh, they rejected the reverse design which was a close copy of the then-current French 2-Franc coin. A revised reverse design showed an olive branch across the middle. Later in 1908, the final design included a pair of matched wheat stalks with the words "one cent" in the middle. Brenner included his initials, "V.D.B.," at the bottom. The final design was approved early in 1909, but too late to honor the centennial of Lincoln's birth on Feb. 12. Within 24 hours of its release, a stream of complaints came into the Treasury that Brenner's initials were too conspicuous and too "commercial." By Aug. 4, 1909, the Treasury decided to revise the dies and remove the initials and continue production through the rest of the year without them. Brenner was very upset, since other engravers such as Bela Lyon Pratt and Augustus St. Gaudens had their initials on their coins at the time. The last of the 1909-VDB cents was minted and released on Aug. 5, 1909. 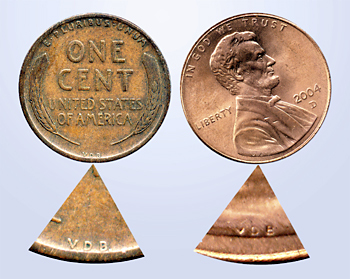 Rumors spread that the cent itself would be discontinued and the existing 1909-VDB cents would be rare and valuable. In fact, 27 million 1909-VDB cents were released, and within a few days, all had been gobbled up by eager collectors and speculators. It was not until the Great Depression, starting late in 1929, that rolls and rolls of these shiny, mint-condition coins began to show up as people ran low on cash. In a 1934 price list, they were advertised for 15 cents each. As late as 1960, uncirculated rolls started to come on the market as estates of people who bought them back in 1909 were being sold off. Today, this popular short-time issue sells for $15 in mint condition and much more for brilliant pieces.